Hi everyone! I must apologize for my absence these past couple of weeks… but it’s been for a good reason, I assure you. You see, I have been busy writing a book and this past month or so has been about me manically testing recipes and proofing text to make sure everything is ready as soon as possible. I’m happy to say I am now finished and the book will be available next week, listen out for more details in the next few days! Anyway, for now I am sharing this very refreshing drink I made over the weekend. 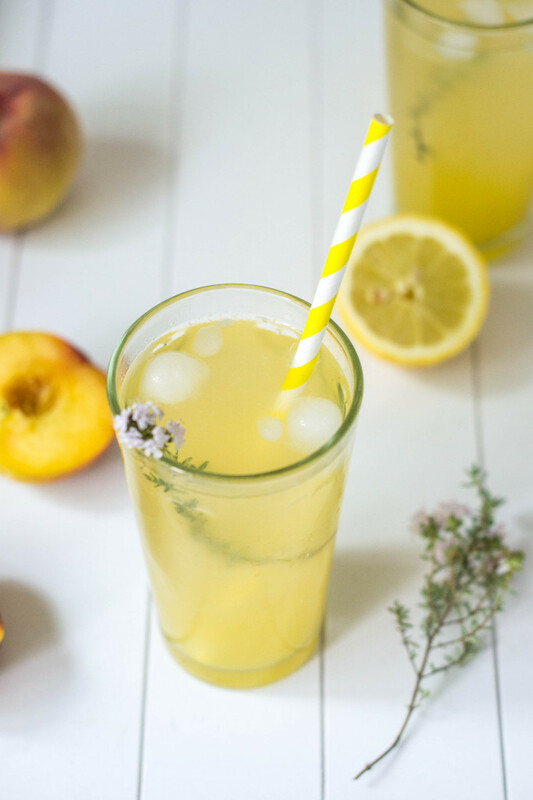 A fresh lemonade, sweetened with maple syrup and infused with peach and thyme flavours. It’s been very muggy these past few days and this really hits the spot in terms of hydration and taste. 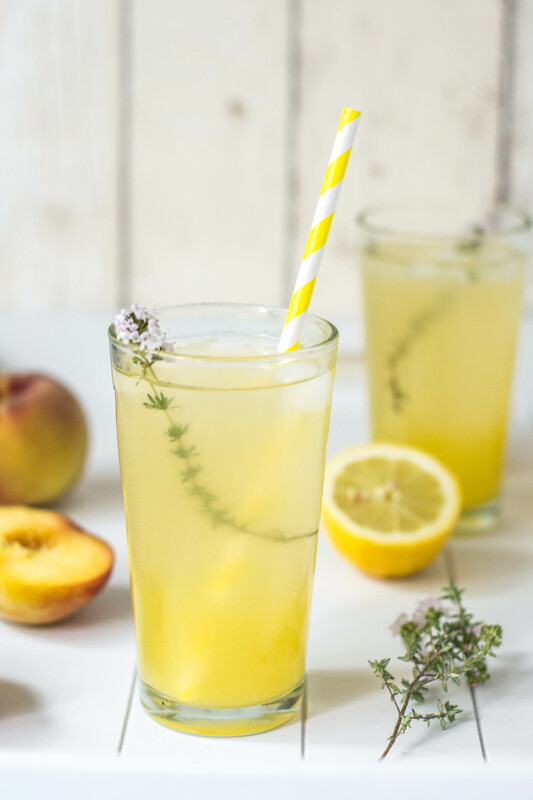 It has everything you love about homemade lemonade but with the sophisticated pairing of peach and thyme along with a healthier sweetener. 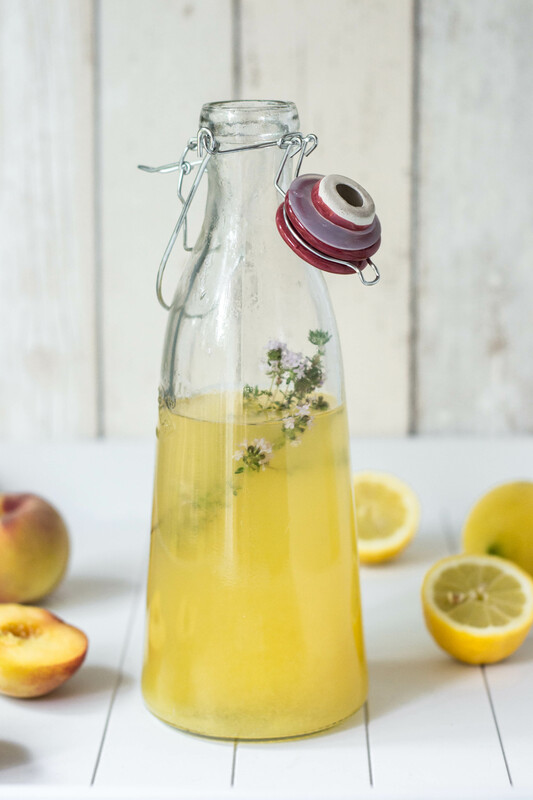 A delicious, thirst-quenching, homemade lemonade infused with maple, peach and thyme flavours. 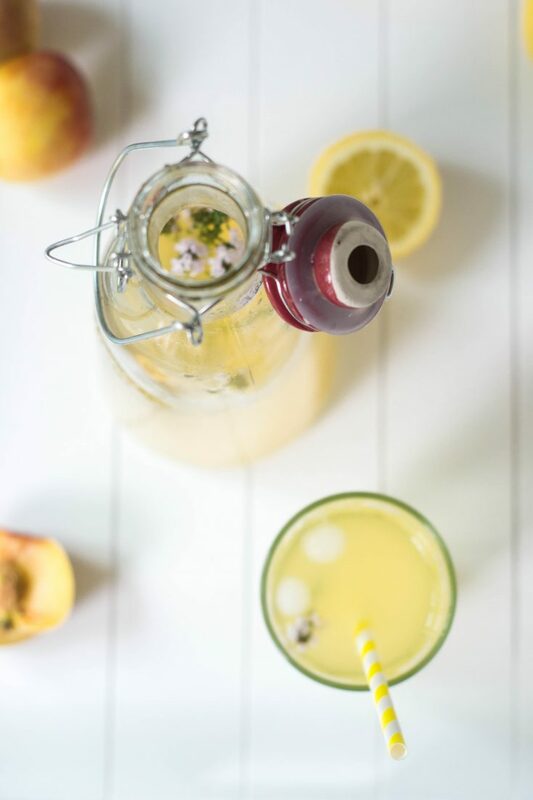 In a blender, combine the peaches, lemon zest, thyme, maple syrup and 1/2 cup of the water. Blend until smooth. Strain the mixture through a fine-mesh sieve and into a large pot or bowl. Discard the leftover pulp. Stir in the lemon juice then top up with the water until you reach a desire taste / sweetness. Add more if needed. Pour into jugs or bottles and keep in the fridge for up to 5 days. To serve, pour some over a glass of ice and add a few sprigs of fresh thyme and lemon slices to the glass, if you wish. This sounds absolutely delicious! Great combination. I'm definitely going to try this, thank you for sharing it. Congrats on the book!! How exciting. The lemonade looks amazing! Yum this sounds wonderful and so refreshing perfect for the (hopefully) sunny moths ahead! Tis very refreshing indeed, Tamzin! We drank the lot up within 2 days and I'm craving more aolready, I'll have to make some again (if and) when the weather get's hotter. I recently started a Pinterest 'drinks' board and this one is definitely going on it! Honestly, it sounds delicious. I would happily drink a few of these over any alcoholic cocktail. Congratulations that you've finished your book. Wow, what an accomplishment! Can't wait for the big reveal! This sounds amazingly refreshing Amy and the photos are stunning! So pleased to see you have been writing a book......... Your talent needs to be captured! I am sure it will be fantastic! Beautiful pictures and recipe! Can't wait to hear more about this book! Thanks Emma! I can't wait either! Oh so yummy... Your photography is superb. 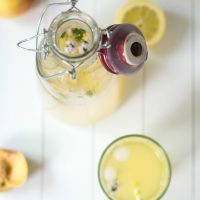 I can only imagine how thyme and peaches make a regular lemonade so delicious. Good luck with the book. Cheers!